I saw a lot more than the Big Cats at this former royal hunting ground that is now the world’s most fabulous tiger preserve. It’s strange that I’ve been to India so times, yet not to Rajasthan. At least, not the Rajasthan that most people know. 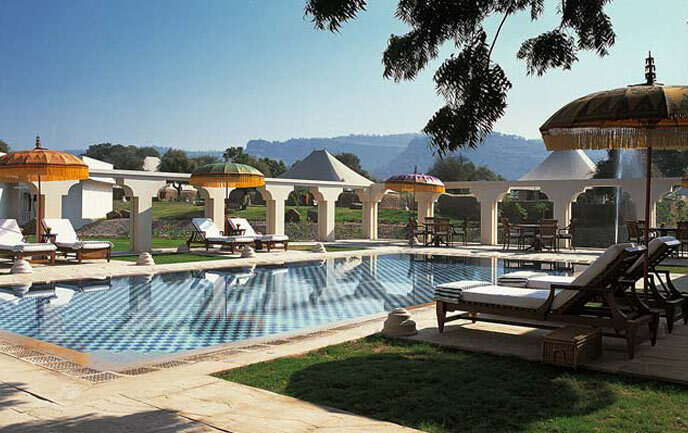 Most visitors head straight to the famous desert fortresses and palaces of Jaipur and Udaipur when they go to India’s most famous state, but I’ve only touched the edge of Rajasthan, at an unlikely, and unexpectedly fabulous tiger safari camp. 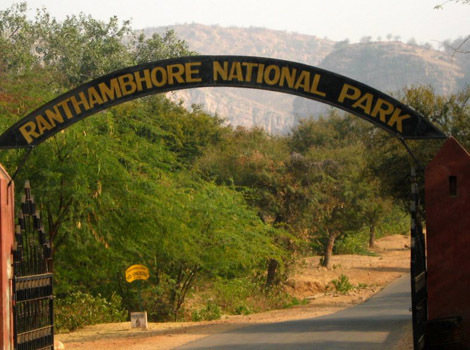 I’ve been to many safari parks in Asia, each one unique, some magical, and all of them memorable in their own way, but I have to say my favourite in India is Ranthambore National Park, located on the eastern edge of Rajasthan state. 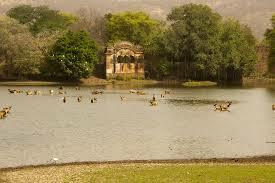 It used to be the private hunting grounds for the Maharajahs and has been home to tigers for centuries. Thankfully no tigers are hunted any more, and it’s now one of the most beautiful and bountiful tiger sanctuaries in the world, as well as home to myriad other animals and birds. 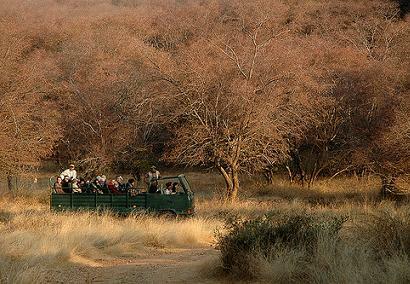 I’ve never seen a wildlife park so utterly teeming with herds of animals, and flocks of birds literally scampering out of the paths of jeeps the way they do at Ranthambore. At some other parks, you have to spot the fuzzy distant animal shapes with binoculars. The park allows two safaris daily, the dawn safari and the afternoon safari. 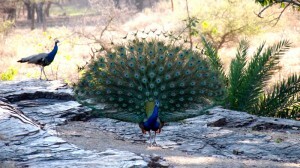 Daybreak over virgin forest is one the nature’s loveliest sights, but we were shivering in a blue-tinged, pre-dawn mist on the morning outing while the open-top jeep whizzed into the brush of the park, which also known as Ranthambore Tiger Preserve. We’d been advised to bundle up for our dawn safari, and for good reason. 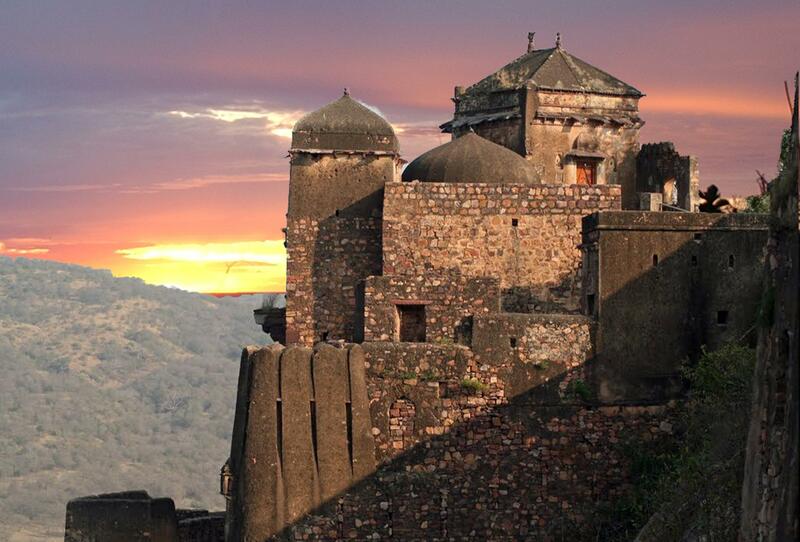 Mornings and evenings in Ranthambore can get as cold as the days are hot – typical climate for northwestern India. In the front seat, our guide looked very military in an olive-toned wooly balaclava, while the driver kept a firm grip on the wheel in thick, warm gloves. I was fascinated by the big, exotic jewelry they wore in their ears. I love the way men in India wear such flamboyant jewelry like drop earrings with such casual flair. It’s fabulous! They seemed to revel in the sharp breeze, the guide occasionally turning round to share a word with us in the seat, where I was clutching the strings of my brand new safari hat to keep it from flying off into the wilderness, while nervously eyeing my seat mate, who appeared in danger of strangulation by the wildly flapping ends of her delicate pashmina scarf. “Next time I go looking for tigers in India, bring fuzzy, form fitting head gear:” I reminded myself. Later that day on the afternoon safari, our jeep whizzed through different types of terrain. 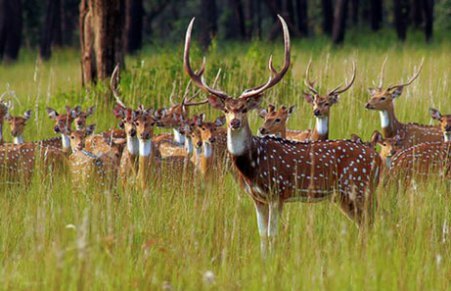 Located in the outer reaches of the desert state of Rajasthan, what’s called ‘jungle’ here is more of a scrubby, thick forest interspersed with wide, placid lakes and hilly clearings covered with a lush golden carpet of tall blonde grass that looked fantastically beautiful when it rippled in the wind like waves on the sea. The sight of it made me want to jump out of the jeep and run through it naked in joy. Which would have been a bad move. Oh. Um… I’m glad I didn’t run through the grass naked then. We stared intently into the yellow grass and surrounding brush, but I was nonplussed. The tiger is an elusive cat, and sightings are notoriously few and far between. 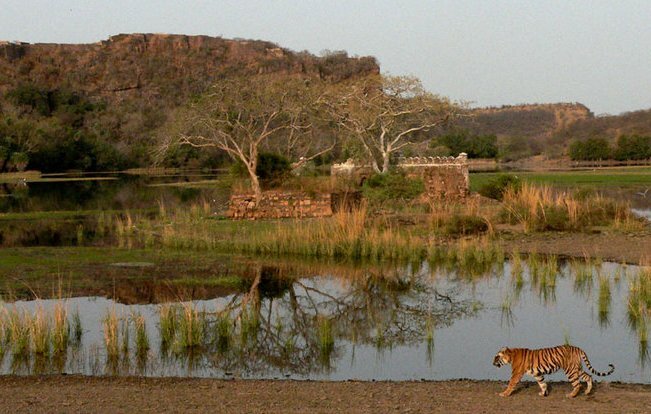 However, this is one of the biggest parks in India and if you are looking for tigers, this is the place to see them. We were hoping to catch sight of a mother and two cubs that had been frequently sighted over the past few months. The park, however, was teeming with an abundance of other animals that serve as tiger snacks. Everywhere we turned, there were herds of spotted and barking deer, antelope, wild boar, and monkeys that appeared to freeze and strike fancy poses the minute we point our cameras. The jeep trail was constantly overrun with flocks of partridges and peacocks, the trees laden with colonies of vividly hued parakeets and the pond heaving with snipe, kingfishes, cormorants, storks and enough other birds to fill a field guide. 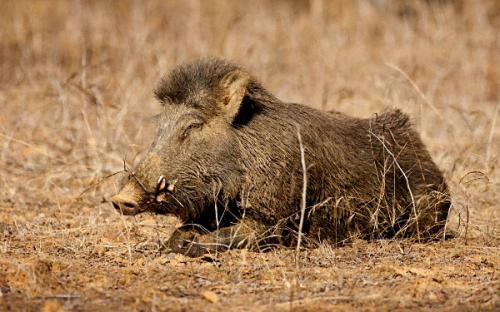 This is the handsomest, most well-groomed wild boar I’ve ever seen. Love the hair do. This is my kind of guy. It sounds like I’m exaggerating but honestly, I’m not. I felt like a Disney princess who opens her arms wide and all nature’s creatures big and small appear and surround her. 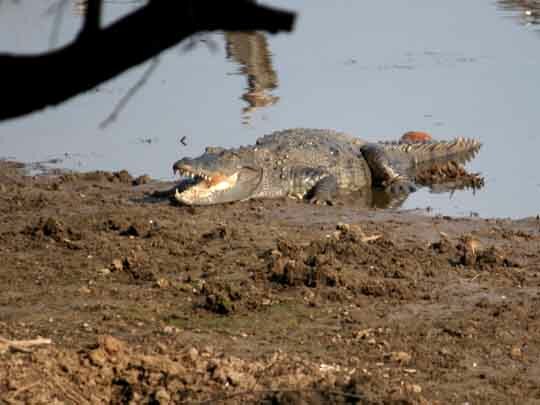 The animals seemed so fat and content that crocodiles sunbathing on the riverbanks don’t bat an eyelid as peacocks strut within jaw-snapping proximity. All the animals here seem to know how good they look.There was a lot of this type of action going on. 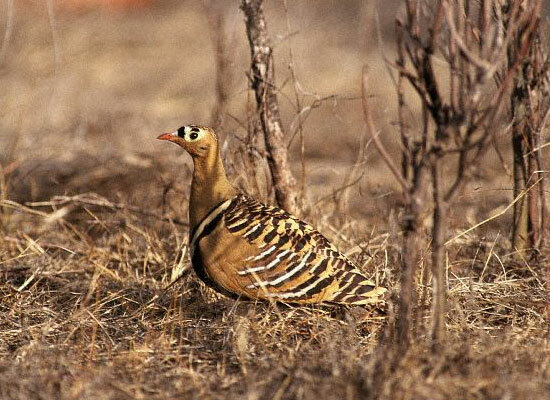 Aside from the teeming flora and fauna, there’s more than enough to see if you don’t spot a tiger. 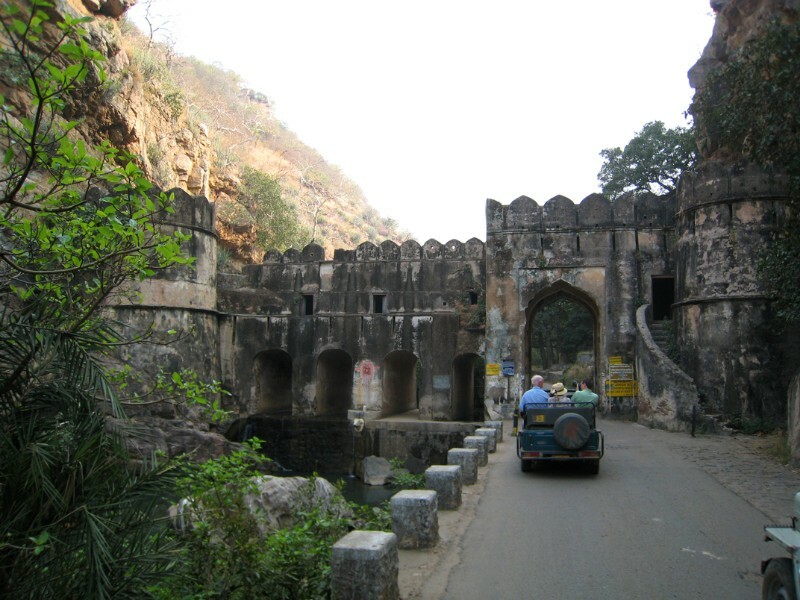 Ranthambore was once the private hunting preserve for the fabulous Maharajahs of Jaipur. 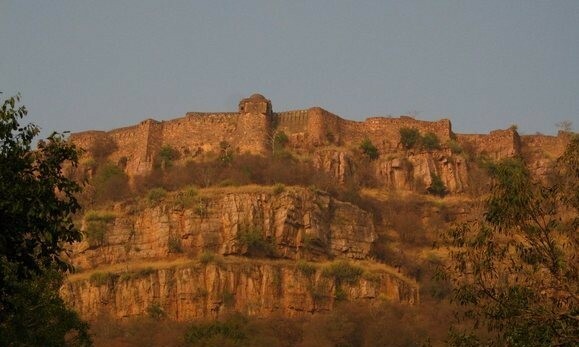 The park is dotted with picturesque remains of centuries-old domed pavilions emerging from among the greenery, while high on a cliff, the majestic hulk of the thousand-year-old Ranthambore Fort looms dramatically silhouetted against the skyline. We roamed all over the park looking for big cats and for a while it seemed we might not see one. Finally we were lucky. At the end of the day, while making our way out towards the great ruined archway at the park’s gate, word arrived that a tiger’s been spotted. Unfortunately, there was a mass of jeeps already convened at the site when we arrived, as everyone was leaving the park at the same time and happened to in the same area. And there was the tiger, standing quietly not far from the path. Though we were very excited to see the tiger, the magnificent creature was unphased by the gaggle of snap-happy onlookers and after giving us his best silent stare, he gave a bored yawned and gracefully strolled up the hill to a quieter spot under a tree. 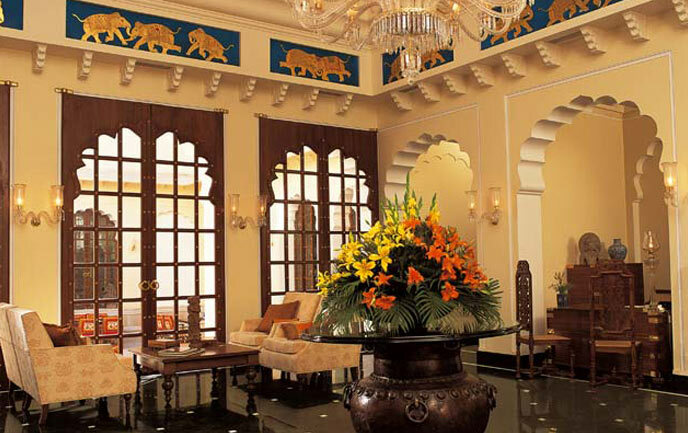 As the park’s star attraction, tigers are not only on every T-shirt and hat sold around Ranthambore; they were also the key décor motif at our hotel, the Oberoi Vanyavilas Resort, one of the many fabulous properties in the luxurious Oberoi Resorts group. (One afternoon I walked into the village and bought an adorable hand-embroidered tiger T-shirt and two bedspreads, by the way). 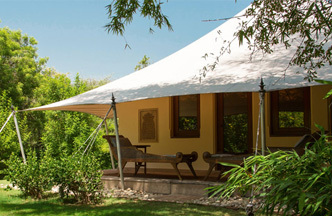 There are plenty of tented camps in India, but the Oberoi Vanyavilas is the country’s first luxury jungle camp, offering tented units set amidst landscaped grounds with citrus and mango orchards and ponds. 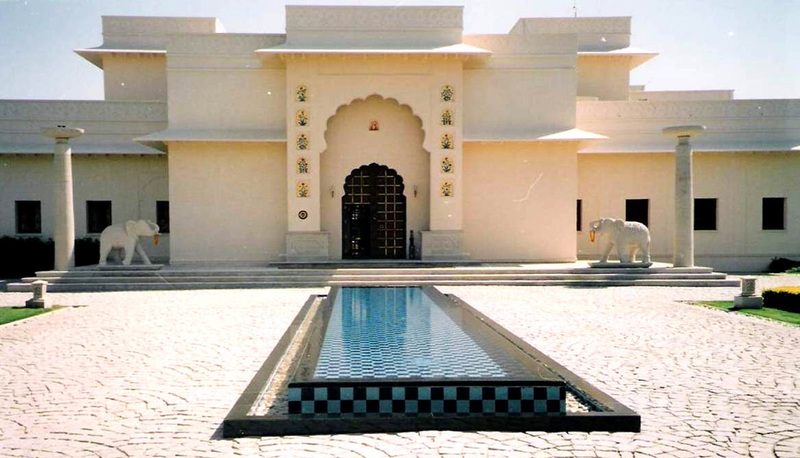 The resort’s main lodge is designed as an elegant, traditional Rajasthani mansion, with mural-painted walls and a sunken, open-air courtyard where meals are served. 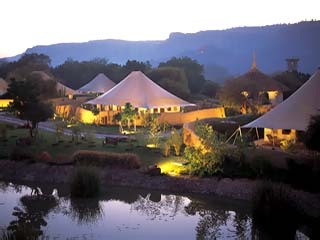 A heated pool and spa facilities keep you relaxed and pampered between safaris, and there’s even a tented gym. 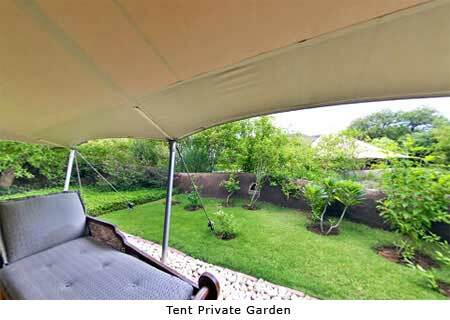 I absolutely adored my “tent”, which was more of a luxury villa with a tented canopy roof and terrace. 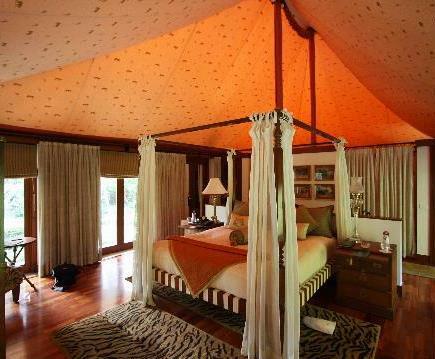 Maybe “ tent villa” is a more appropriate term. 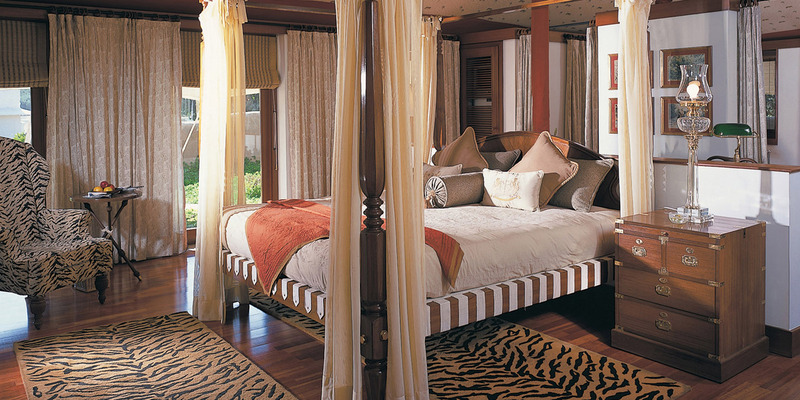 Inside my unit were two plush canopy beds, sofas, gleaming wood paneling and furniture, and Tibetan tiger rugs on the floor (these are my favourite type of rugs, and are not actually made of tigers but are area rugs woven in a tiger pattern). Each tent villa is tucked inside its own spacious private garden enclosure, so you can sit out on your terrace in your pajamas, if you like. 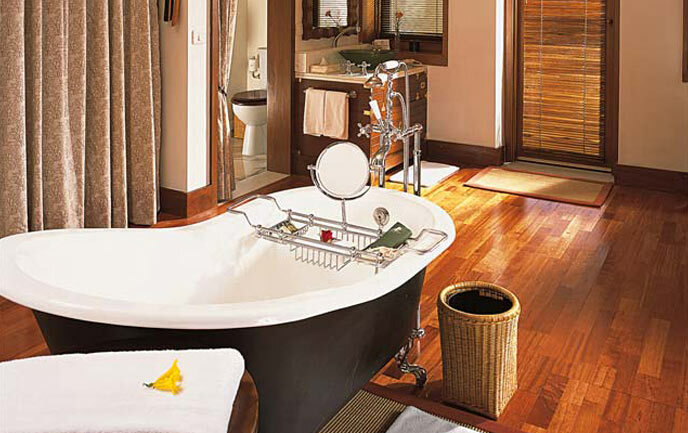 The gleaming bathroom was huge, and included a charming old-world footed bathtub and a new-world marble shower with luxurious fixtures. 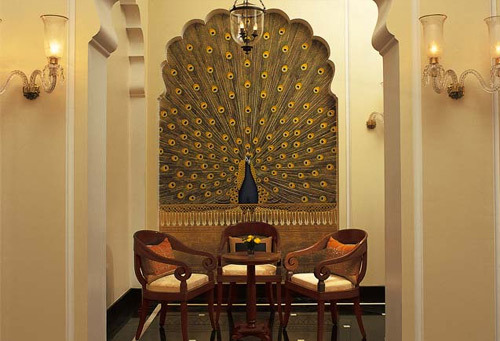 Inside the main lodge, there’s a formal dining room with beautiful traditional Rajasthani paintings depicting wildlife scenes covering the walls. 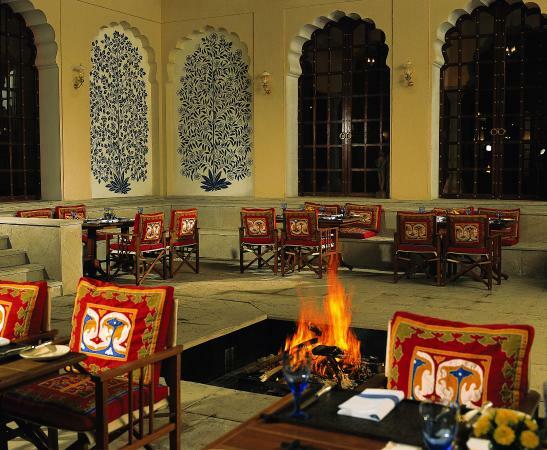 However, we preferred having all our meals out in the fresh air, in the fabulous courtyard with its painted murals and open fire pit. The waiters in their bright red turbans and beautiful traditional garments added even more charm to the scene. At dinner after the safari, red sparks crackled and flew from the open fire, and vanished into the starlit sky above. I snuggled in my (brand new) Indian pashmina shawl against the evening chill. The talk was of tigers and the young, friendly waiters were genuinely pleased that we had finally spotted one. Our traditional Indian dinner came with a little bowl of thick transparent liquid that I had no idea what to do with. “This is ghee, our Indian clarified butter that we eat with our meal. 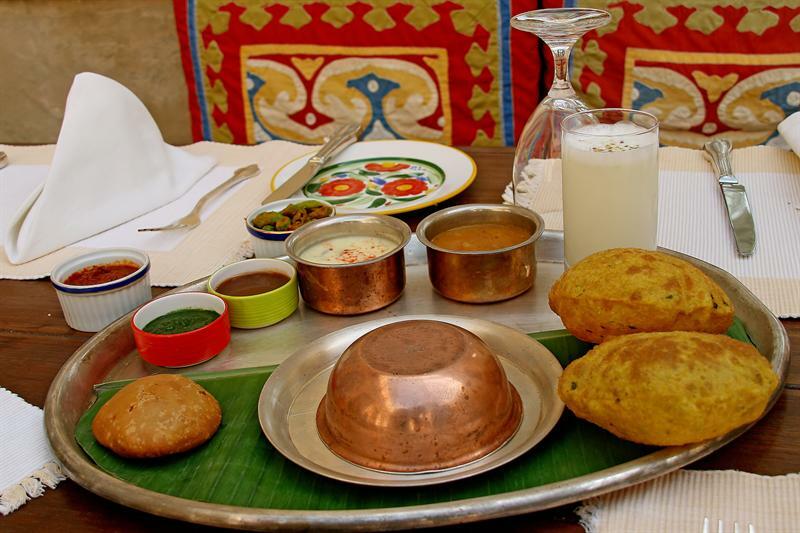 When we have visitors in an Indian home, we give it to honoured guests.” explained the waiter. “Very, very delicious” he added enthusiastically. I nodded and looked at the ghee. When he found out that I was from Bangkok and knew the resort’s designer, Bill Bensley, he lit up with delight. “We love Bill! Such a very, very nice man! We also love friends of Bill!” and with that, he generously brought me an extra big bowl of ghee. Now I had not one, but two bowls of rich, liquid fat that I didn’t know what to do with. I mowed my way through everything else around the bowls of ghee and was so full that I don’t know how I stayed conscious to walk back to my tent. I mean tent villa. When I woke up in my fabulous four-poster bed late the next morning, I lazed on my back in the soft cotton sheets while the rising sun gradually illuminated the ceiling canopy. I slowly realized that the tented ceiling was flickering with thousands and thousands of tiny gold sparkles … the canvas ceiling was hand painted with hundreds of tiny gold-striped tigers that were set aglow in the rising sun. I was amazed and delighted. What a gorgeous way to wake up! It was a magical moment that I’ll remember forever. So even if you go there and don’t see a tiger, this could be the next best thing. 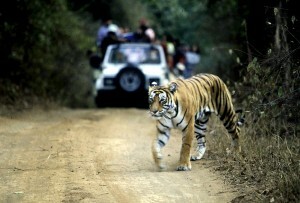 Have you been on safari in India? How was your experience? Great post! Visited two tiger parks in India but only saw pug marks. 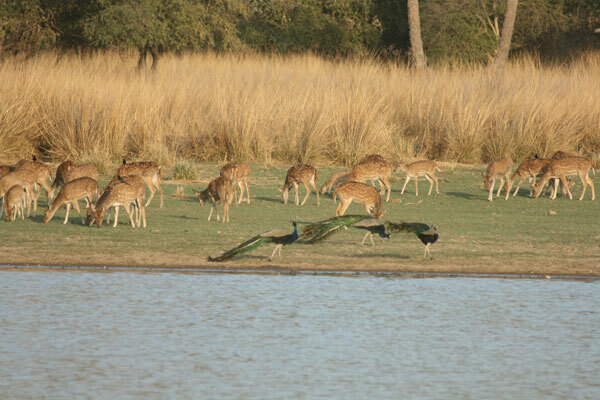 We should have gone to Ranthambore! Yet another excuse to return to India. I’ve been to other parks in India and this is the first place I saw the tiger. This is the place to see them! And the tigers are so relaxed and calm, and are unfazed by the jeeps and people. I love this park! It’s a wonderful sanctuary! What an amazing experience! 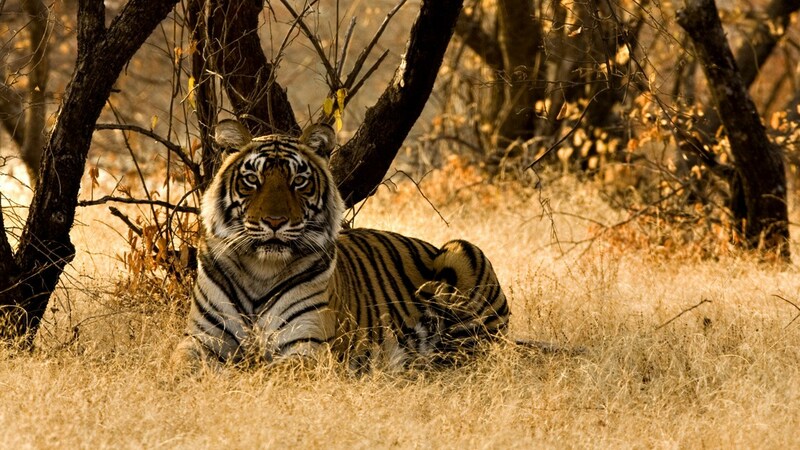 It’s a dream of mine to see tigers on safari….wonderful to hear that you were able to.